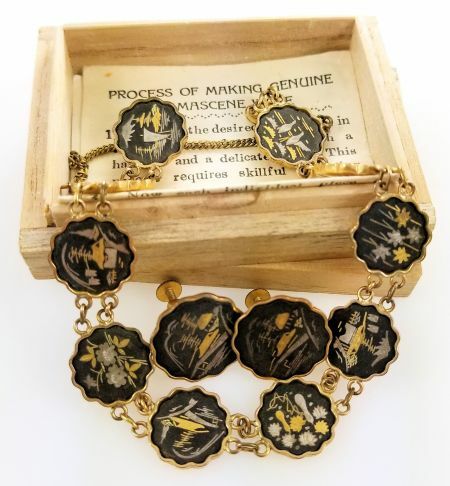 Description: An amazing find from the mid 1900's of a Japanese damascene bracelet and earring set in their original box with the manufacturer's paper. Damascening is the process of inlaying typically, gold/silver strings, into an oxidized steel background to produce intricately beautiful scenes. Amita originated in 1932 ceasing operations, in 1942, due to WWII, the starting up, again, in 1946, in Kyoto. 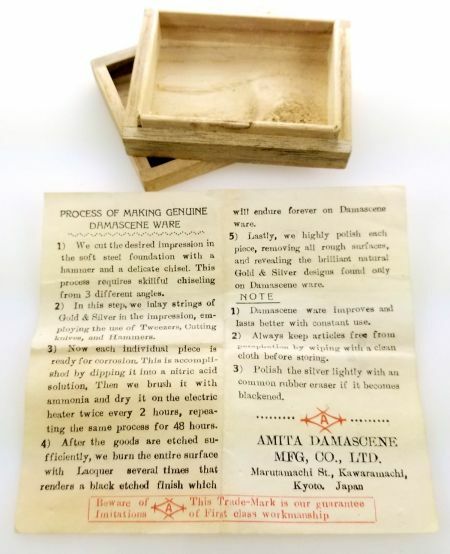 In 1947, Amita Damascene Factory changed its name, to Amita Damascene Co., Ltd. The company continued to expand its business, into the 2000s. This set is circa late 1940’s to 1950's. 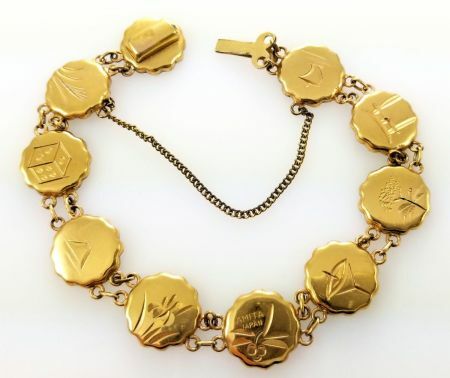 The bracelet has 10 linked panels each featuring a different scene. 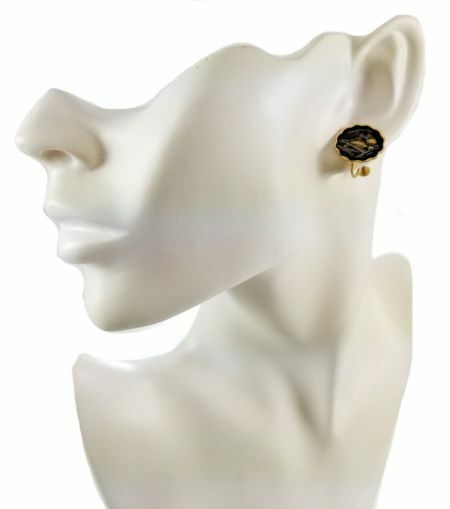 The darkly oxidized steel is set in the bright 24k gold plated base, then carved and inlaid with silver and gold wire. 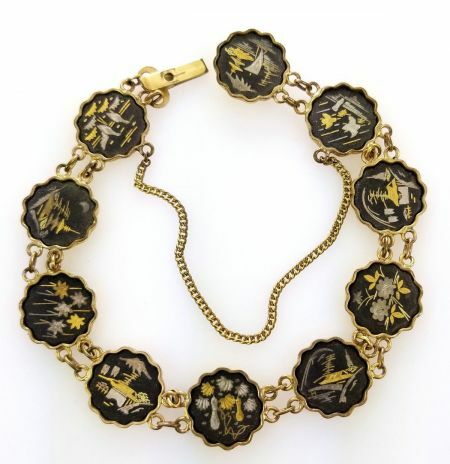 There are floral and Japanese structure scenes, depicted and on the back each link has an imprinted image. The bracelet has a safety chain and box clasp closure. There are matching earrings. Both items are marked. 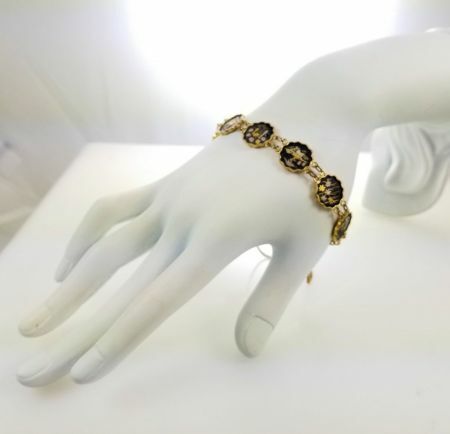 Measurements: The bracelet measures 1/2"wide and is 7 3/4" in length. 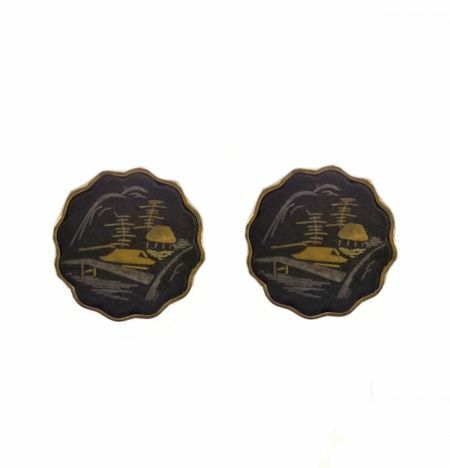 The earring are 5/8" in diameter. Condition: Very good condition. 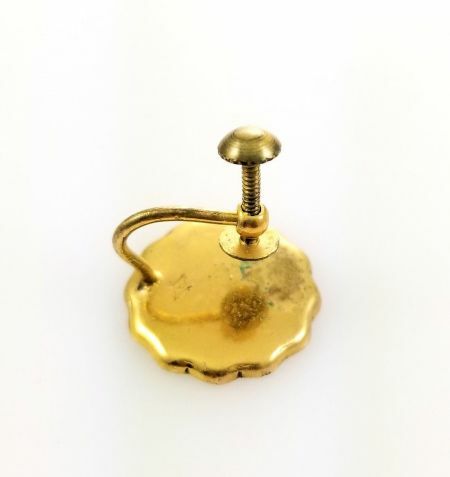 One earring shows wear to the plating on the back.